Alro stocks A513 Type 5 Drawn Over Mandrel Tubing. DOM Steel Tube is produced using uniformly high quality C1020 carbon steel strip and is formed and electric resistance welded into its basic shape. After annealing to produce a uniform grain structure throughout, the tube is then cold drawn over a mandrel to give it these advantages: uniform concentricity around the central axis, better ovality, closer tolerances, denser surface, uniform wall thickness, and higher physical properties. The cold working process works the weld area to produce a sound, dense, and homogeneous structure comparable to that of the base metal. The weld line disappears, causing DOM tube to be virtually seamless. 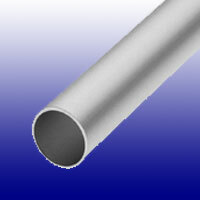 The surface is superior to that of regular seamless tubing, since the material has been cold drawn from strip steel. The hole is straight and concentric with the outside diameter. DOM Steel Tube may be machined, formed, welded, carburized, and subjected to other fabricating techniques that are ordinarily applied to low carbon steel. The use of DOM Steel Tube gives you a guaranteed micro-inch surface and lower productions costs by reducing or eliminating such operations as boring, honing, and finishing.